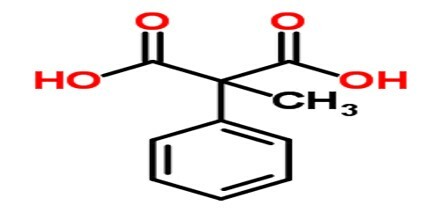 Malonic Acid (or C 3 H 4 O 4) is a white crystalline acid derived from malic acid and used in making barbiturates. It is also called Propanedioic Acid, (HO2CCH2CO2H), and a dibasic organic acid whose diethyl ester is used in syntheses of vitamins B1 and B6, barbiturates, and numerous other valuable compounds. The ionized form of malonic acid, as well as its esters and salts, are known as malonates. For example, diethyl malonate is malonic acid’s diethyl ester. The name originates from the Greek word μᾶλον (malon) meaning ‘apple’. Malonic Acid itself is rather unstable and has few applications. Its calcium salt occurs in beetroot, but the acid itself is usually prepared by hydrolyzing diethyl malonate. It undergoes the usual reactions of carboxylic acids as well as facile cleavage into acetic acid and carbon dioxide. It is often mistakenly believed to occur in beetroot at high concentration, and a study on the composition of sugar beet liquors revealed no malonic acid. It exists in its normal state as white crystals. Malonic acid is the archetypal example of a competitive inhibitor: it acts against succinate dehydrogenase (complex II) in the respiratory electron transport chain. It is also frequently used as an enolate in Knoevenagel condensations or condensed with acetone to form Meldrum’s acid. The esters of malonic acid are also used as a −CH2COOH synthon in the malonic ester synthesis. It is also known to be a competitive inhibitor of succinic dehydrogenase, the enzyme responsible for the dehydrogenation of succinate within Krebs cycle. 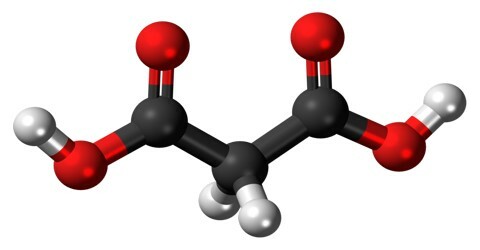 Malonic acid and its esters are characterized by the large number of condensation products. They are important intermediates in syntheses of vitamins B1 and B6, barbiturates, non-steroidal anti-inflammatory agents, other numerous pharmaceuticals, agrochemicals and flavors & fragrances compounds. Malonic Acid was first prepared in 1858 by the French chemist Victor Dessaignes (1800-1885) via the oxidation of malic acid. More recently, malonic acid has been produced through fermentation of glucose. This higher yielding route could offer environmental benefits via elimination of cyanide and chloroacetic acid use in addition to carbon sequestration. 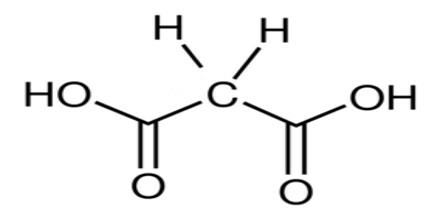 Diethyl malonate, CH2 (CO2C2H5)2, also called malonic ester, is prepared by the reaction of ethyl alcohol with cyanoacetic acid. Its utility in synthesis arises from the reactivity of its methylene (CH2) group; a hydrogen atom is easily removed by sodium ethoxide or other strong base, and the resulting derivative reacts readily with an alkyl halide to form a diethyl alkylmalonate. One application of malonic acid is in the coatings industry as a crosslinker for low-temperature cure powder coatings, which are becoming increasingly valuable for heat sensitive substrates and a desire to speed up the coatings process. It is used in a number of manufacturing processes as a high value specialty chemical including the electronics industry, flavors and fragrances industry, specialty solvents, polymer crosslinking, and pharmaceutical industry. In food and drug applications, malonic acid can be used to control acidity, either as an excipient in pharmaceutical formulation or natural preservative additive for foods. It is also used as a building block chemical to produce numerous valuable compounds, including the flavor and fragrance compounds gamma-nonalactone, cinnamic acid, and the pharmaceutical compound valproate. It (up to 37.5% w/w) has been used to cross-link corn and potato starches to produce a biodegradable thermoplastic; the process is performed in water using non-toxic catalysts. Reference: britannica.com, dictionary.com, chemicalland21.com, wikipedia.